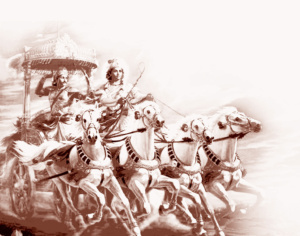 The Bhagavad Gita is the premier, ancient Indian text on yoga and spirituality. It offers both philosophical and practical guidance into the yoga worldview. One old devotee, now deceased, shared that Babaji had a copy of the Gita with him when he first appeared at Haidakhan. Babaji himself encouraged everyone to read it and study yoga. Physically, we experienced Babaji as a loving presence, cosmic and universal. Those experiences still support us as an open and inviting community. As a particular expression of the divine, Babaji was an open revelation of love and yoga; but Babaji was, and is not, always easily read and understood. The Eknath Easwaran’s translation of The Bhagavad Gita is an accessible classic. Eknath was a Sanskrit scholar, English professor, accomplished teacher and founder of the Blue Mountain Meditation centre in California. His insightful translation and commentaries of the Gita text are resonant of all world spiritual traditions and with Babaji. Babaji’s scheme of Truth, Simplicity and Love are imbedded and enlivened in this translation. Truth is seeing beyond the perceived dualities of life. Simplicity is “the radiance in all that shines” in the present moment (10:36). Love is (beholding) the entire cosmos turning within my body, recognizing the Self in others (11:7). Will reading and sharing the Gita enrich our individual and collective conversations? Our community is not about like mindedness; it’s about openheartedness. What better way than to educate ourselves in what is important to us. So please consider reading Eknath’s Gita and see what happens?